ARE YOU struggling to find a good opportunity to grow your money today? ​Does nothing offer good value? Has every bond, equity, property and collectibles market become a bubble on the brink of bursting? What if there was another kind of asset – an asset untouched by speculators – which has consistently beaten almost all major financial markets year after year...? ...yet which, because until now it's been too difficult to buy and manage, remains practically unknown to investors today...? 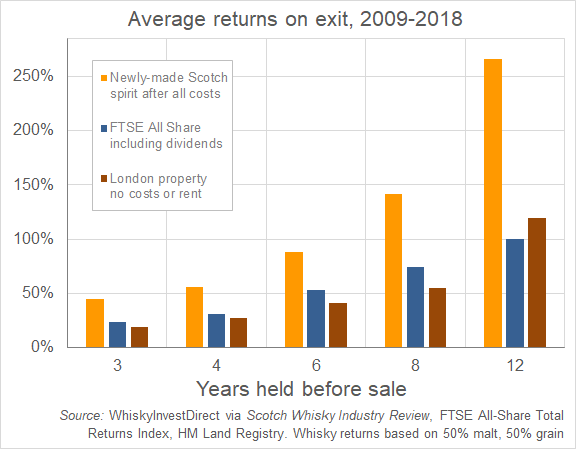 Over the past decade, according to trade broking data, maturing Scotch whisky has outperformed the FTSE – dividends included – and paid better returns even than London property. These returns from maturing Scotch whisky, still in the barrel, have also been remarkably steady. Since the financial crisis began a decade ago, barrelled whisky has never returned less than 60% after all costs when sold at six years old. In that time it has never paid less than 107% at eight years old, and never paid less than 189% at 12. We're not talking here about rare bottles of Scotch, inflated at auction by collectors or speculators. Nor have these returns come from the very top-end of single malt whiskies. This is simple commodity blending whisky still in the barrel, traded and held inside Scottish warehouses with no VAT tax or duty to pay. 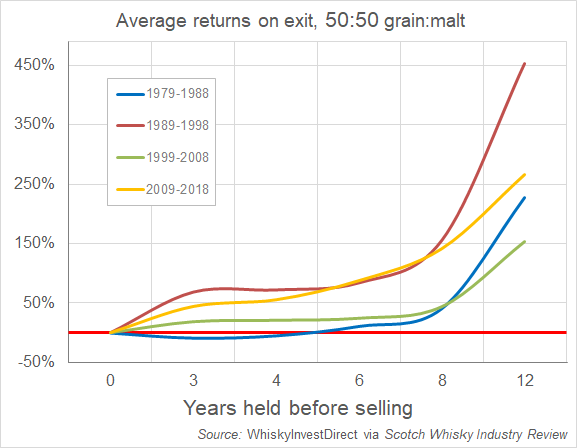 The chart above shows you the average returns across the hundred or so different blending whiskies traded by distillers, bottlers and brand owners, while it's still inside the barrel. This smoother drink can mix 40 or more single malts with 60-70% of a plainer grain whisky. Easier on the palate, it's much easier to brand, and to sell at high volume. That's why blended whiskies account for 9 bottles of Scotch in every 10 sold worldwide today. Think France drinks Cognac? Last year the French drank 40 times as much Scotch, importing more whisky from Scotland than France exported brandy worldwide. Canada has been making its own whisky for over 200 years. Yet Ottawa's House of Commons keeps choosing single malt Scotch as its official whisky, just as it has since 2003. Japan's whisky industry is gaining favour with single malt drinkers, but it relies on Scottish supplies of new spirit, buying well over four-fifths of all the Scotch exported younger than 3 years old since 2010. All told, Scotch whisky sells for higher prices than any other type of liquor worldwide. It accounts for 4% of global spirit sales by weight but THREE TIMES as much by value. What's more, the Scotch industry sells 93% of its output abroad...giving maturing whisky strong potential to help defend UK investors against weak Sterling and a resurgence of UK inflation. Scotch whisky's export success comes thanks to more than 100 years of deep global branding and marketing. Drinkers everywhere recognise and enjoy it as a high-status, aspirational but affordable luxury. Take Johnnie Walker, for instance. The world's No.1 spirits brand today, it was first heavily marketed in the 1870s. By 1909 it already wore its distinctive rectangular bottle, with the sloping label and 'walking man' logo. By 1920 it was on sale in 120 markets worldwide. Coca Cola hadn't even reached British highs streets. Winston Churchill knew Scotch's huge value. As Britain's war-time prime minister, he ordered supplies of grain to Scotch distillers to re-start in 1944, as soon as victory looked certain. "Scotch takes years to mature and is an invaluable export and dollar producer." Churchill could have been speaking in 2019. Export demand sees more than three cases of 12 bottles each leave Scotland for overseas markets every second. Global sales have grown 1.5% per annum by volume over the last 30 years and more than twice as fast by value. Demand has deepened as it spreads, with 27 national markets now buying more than half-a-million cases each every year – up from 14 in 1985.
Who buys and drinks all this Scotch? Advertising here in the UK might suggest it's well-heeled young hipsters...keen followers of fashion with a taste for small-batch gins and craft ales. The spirits industry certainly targets that 20-30 year old market. Because globally, half-a-billion people will come of legal drinking age over the next decade. Wherever they live...from Brazil to Botswana, Turkey to Thailand...these breadwinners, managers and business owners aged between 40-60 often enjoy a good Scotch. This key demographic will only grow larger as today's newly-made spirit slowly matures into valuable 12-year old Scotch...swelling more than 6% across the world's upper-middle and high-income nations on World Bank forecasts. That number excludes 'dry' Islamic countries of course. It also excludes China, because whisky has yet to make serious inroads into the world's second-largest economy. Yes, China is now a key target for the industry's multi-million pound marketing budgets. But you don't need Scotch demand to grow for maturing whisky to gain value as it ages. Past performance is no guarantee of future returns of course. Within these average trends, prices and gains have fluctuated. Since 1978, three-year old whisky has been worth less than it cost when first made a total of 12 times once you allow for the trading and storage fees. Owners would have faced a loss 11 times at 4 years old...10 times at 6 years old...and three times at 8 years old over the last four decades. But the longer it stays in the cask, the more mellow and mature the whisky becomes...and the more money whisky drinkers will pay to savour it. That's why, according to the four decades of trade-broking data, maturing Scotch bought new and sold at 12 years old has never yet lost money after all costs. And as the industry has consolidated over the last 20 years or so, more cautious production means prices have become more stable and seen steadier appreciation. WhiskyInvestDirect has already secured stocks of maturing whisky from eight of the top Scotch distillers – Diageo, Beam Suntory, Whyte & Mackay, Glen Turner, Distell, Inchdairnie, Bladnoch and Tullibardine – and also from the new Borders distillery opened in 2018. Between them these distillers represent almost half of annual Scotch production, making the key malts and grain whiskies blended together by many of the world's best-selling brands. Rupert Patrick, our CEO, is actively working to add new stock-lines from other key manufacturers. But the industry is so huge, there's no chance of your investment skewing prices or risking a 'bubble'. Around 3 billion litres of raw spirit is now slowly maturing in oak barrels in Scottish warehouses. Our customers have so far bought 7 million litres between them. If that private stockpile grows to £150 million-worth over the next decade, it will still equal just 1% of the industry's total reserves, priced today at some £15 billion. Security is a key concern too, of course. 'Fine wine' rip-offs keep hitting the headlines, and the Scotch industry itself saw a series of scams in the 1990s, with investors invited to buy barrelled whisky which did not in fact exist. That's why all the stock on WhiskyInvestDirect is fully audited, with the cask lists from the independent tax-bonded warehouses we use to care for your Scotch posted online for you to check against your own holdings. HM Revenue & Customs keep a very close eye on these warehouses too. Because the taxman has a deep interest in ensuring that all production is properly stored and accounted for...and that full duty is paid when the whisky is finally released for blending and bottling. Unlike the taxman, you aren't guaranteed to turn a profit from maturing Scotch whisky. But it's still nice to know that thanks to ever improving production efficiencies newly made Scotch now costs you less in real terms than ever before. So your returns would be even higher than our illustrations if the prices for mature spirit just stay where they are now. Or go back 12 years and buy gold for just £1 in every £3 that it fetches today. Maturing Scotch whisky offers you the possibility of doing just that today. Because you can now buy young spirit...untouched by speculators, and unknown to almost every investor...before it matures and gains in value. Open an account today or learn more here. This page provides only general information. It does not consider your personal situation or needs. You are entitled to rely on the truth of the historic data above, but you cannot rely on any forward projections stated or implied. Previous price trends are no guarantee of future movements. Whisky, a physical commodity, is not an investment within the terms and scope of the Financial Services and Markets Act 2000. Your protection is limited to the resale value of the whisky you own, together with normal insurance covering specified risks including fire and theft. You will not be protected by the Financial Services Compensation Scheme, and you may not fully recover your initial investment. Investing in whisky may involve risks which you are currently unaware of. If you are not able to assess this information, seek expert investment advice.